I’m a diehard fan of horror flicks and since tonight is the one night of the year when almost everyone wants to be scared, it seemed like a good time to recommend some films. All the descriptions are from Netflix and Amazon. Enjoy! 15) The Bay (2012): Two million fish washed ashore. One thousand blackbirds dropped from the sky. On July 4, 2009 a deadly menace swept through the quaint seaside town of Claridge, Maryland, but the harrowing story of what happened that Independence Day has never been told – until now. 13) Apollo 18 (2011): Decades-old found footage from NASA’s abandoned Apollo 18 mission, where two American astronauts were sent on a secret expedition, reveals the reason the U.S. has never returned to the moon. 12) The Thing (2011): From the producers of Dawn of the Dead comes the prelude to John Carpenter’s cult classic film where paranoia spreads like an epidemic after a creature is freed from its frozen prison. 11) Insidious (2011): A family looks to prevent evil spirits from trapping their comatose child in a realm called The Further. 10) Creep (2015): A videographer drives to a remote mountain town after answering a cryptic Craigslist ad for a one-day gig. As the day progresses, the man who hired him becomes increasingly more unhinged and the road to easy money takes a turn for the unexpected. 9) The Possession of Michael King (2014): An atheist determined to disprove the existence of the supernatural is consumed by a horrifying evil force that will not release him. 8) The Conjuring (2013): Based on a true story, ghost hunters Lorraine and Ed Warren help a family terrorized by a dark spirit. 7) The Possession (2012): After a young girl buys a wooden box at a yard sale, she unknowingly unlocks an evil spirit living inside and embarks on a series of terrifying experiences. Based on a chilling true story. 6) The Taking of Deborah Logan (2014): When Mia Medina records the everyday life of her mother Deborah Logan for her PhD thesis on Alzheimer’s, it soon becomes apparent that a terrifying evil far worse than the debilitating disease has taken control of Deborah. 5) The Last Exorcism (2010): When he arrives on the rural Louisiana farm of Louis Sweetzer, the Reverend Cotton Marcus expects to perform just another routine “exorcism” on a disturbed religious fanatic. An earnest fundamentalist, Sweetzer has contacted the charismatic preacher as a last resort, certain his teenage daughter Nell is possessed by a demon who must be exorcized before their terrifying ordeal ends in unimaginable tragedy. Buckling under the weight of his conscience after years of parting desperate believers with their money, Cotton and his crew plan to film a confessionary documentary of this, his last exorcism. But upon arriving at the already blood drenched family farm, it is soon clear that nothing could have prepared him for the true evil he encounters there. Now, too late to turn back, Reverend Marcus’ own beliefs are shaken to the core when he and his crew must find a way to save Nell – and themselves – before it is too late. 4) It Follows (2015): After a seemingly innocent sexual encounter, 19-year-old Jay becomes trapped by a vicious curse – “it” is following her, and the only way to save herself is to put others in harm’s way. 3) The Babadook (2014): In this terrifying thriller, a mother must protect her son from an evil, supernatural entity that has escaped the pages of a children’s book and is lurking in their home. 2) Sinister (2012): Ethan Hawke is a crime novelist who moves his family into a home with a horrific past. But when he uncovers a box of mysterious home movies that seem to point to unspeakable terrors, he unlocks a nightmare that threatens his entire family. 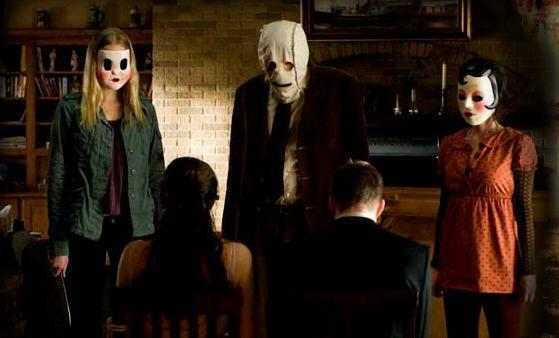 1) The Strangers (2008): In this heart-pounding thriller, a young suburban couple welcomes the peace and quiet of a secluded family vacation home — that is, until three masked invaders make them realize just how dangerous isolation can be.